On this date in 1939 near Salzburg, Austria, Adolf Hitler’s foreign minis­ter Joachim von Rib­ben­trop told Ital­ian dicta­tor Benito Musso­lini’s foreign minis­ter, Gale­azzo Ciano, about Hitler’s deci­sion “to set Europe on fire.” “We want war,” Ribben­trop said to Ciano (who was Musso­lini’s son-in-law), though the German foreign minis­ter refrained from telling his Italian counter­part that Hitler had just signed the order to occupy the League of Nations-admin­is­tered Free City of Danzig (see map below) and had mobilized the German Army along the German-Polish frontier. The next day, August 12, Ciano visited Hitler at his lux­u­rious Alpine resi­dence, the Berg­hof, where he cau­tioned Hitler of the harm war would inflict on the Ital­ian people. Later in the month Hitler separately con­firmed his deci­sion to attack Poland without giving Mus­so­lini the date. On Friday, Septem­ber 1, 1939, the day Germany invaded Poland and Danzig, Mus­so­lini wrote Hitler that he was worried their joint mili­tary and econo­mic alli­ance, the so-called “Pact of Steel” that Ciano and Rib­ben­trop had ini­tialed in Berlin in May 1939, would drag an unpre­pared Italy into the con­flict, and he wanted to bail out. Mus­so­lini was reassured when Hitler promptly cabled back that Ital­ian troops were not needed in Poland. Musso­lini told Hitler that Ital­ian inter­ven­tion would only be pos­sible were Italy given suf­ficient mili­tary materiel and raw materials (e.g., molyb­denum, oil, and rubber) to with­stand French and British attacks, which would surely come now that both demo­cra­cies had declared war on Germany (Septem­ber 3, 1939). Italy, which all along had expected to be involved in a Euro­pean war after 1942, stayed out of the con­flict until June 10, 1940, when Mus­so­lini’s greed to share in the spoils of war spurred a change of heart. Left: The “Polish Corridor,” which provided Poland access to the Baltic Sea via ter­ri­tory that had pre­viously been part of German West Prussia, cut post-World War I Germany in two. 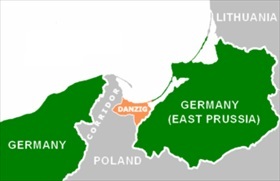 Germans were required to carry a pass­port when paying an over­land visit to East Prussia, now an island surrounded by Lith­u­ania and the Baltic Sea to the north, Poland to the south, and, to the west, the Free City of Danzig (today’s Gdańsk), which was under League of Nations pro­tec­tion and in a binding customs union with Poland. The Nazis con­sidered the entire geo­political arrange­ment intol­erable and insisted that Poland hand over Danzig and permit the Germans to build an extra­terri­torial multi­lane auto­bahn and a rail line across the corridor to East Prussia. Right: After the four major European power brokers agreed in Munich in Septem­ber 1938 to split German-speaking Sudeten­land from Czecho­slo­va­kia, Germans in the Danzig enclave, where they made up 95 per­cent of its popu­la­tion, requested reuni­fi­ca­tion with the Third Reich. 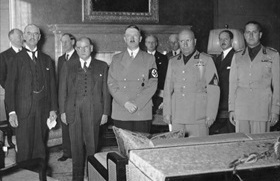 Great Britain’s Neville Cham­ber­lain and France’s Édouard Dala­dier (both to Hitler’s right in this 1938 photo) con­signed the fate of their coun­tries to poli­ti­cians in Warsaw in 1939 when they offered to take any action against another nation that threat­ened Poland’s inde­pen­dence. Polish Foreign Minis­ter Józef Beck saw the British gua­ran­tee as putting Hitler in his place, though it was impos­sible for Poland’s two allies to provide any effective protection. 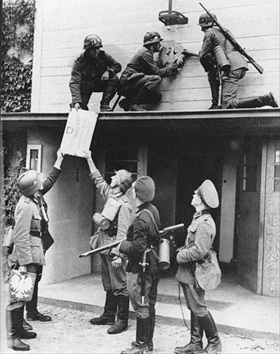 Left: German troops remove Polish insig­nia at the Polish-Danzig border near Sopot (German, Zoppot), Septem­ber 1, 1939, after blasting through Polish defenses. 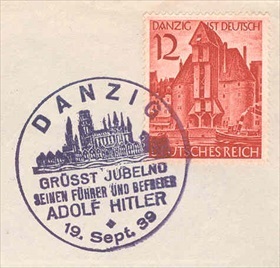 The following day the Free City of Danzig was annexed by Nazi Germany and most of the local Poles, Slavs (Kas­zu­bians), Jews, and oppo­si­tion leaders were arrested and sent to con­cen­tra­tion camps or expelled. As many as 110,000 peo­ple were deported to nearby Stutt­hof con­cen­tra­tion camp, which was com­pleted on Septem­ber 2, 1939, and 85,000 victims perished there.